Harley the prodigy from Peterborough. Harley is 11 years old. His Grandmother told me that he had been ‘diagnosed’ with ADHD – Attention Deficit Hyperactive Disorder. Apparently he couldn’t stand school one bit. Apparently he has ‘difficulty with concentrating’. Harley proved to me, to his Grandma, and to the abundance of ADHD culture that slacklining nullifies attention deficit. It’s very simple; you must pay attention to walk the slackline. Deficit does not allow you to slackline. So how does Harley, a first time slackliner, walk a 10m line in 10 minutes, if he has a deficit of attention? I don’t agree with ADHD as a diagnosis, at all. You put anybody in a boring room, with a boring subject to try and focus on, and they will all have a deficit in attention. I feel that the reason kids are told they have ADHD is because they haven’t been offered anything remotely cool enough to focus on. What Harley needed was to be playing outdoors, enjoying himself and having a challenge to overcome. He needed very little encouragement from me. He relentlessly got up on the line, time and time again, setting a twig as a distance marker underneath the line. 10m in 10 minutes! Incredible! Slacklining fulfilled all his needs, so much so that he conquered the line 60 times faster than most of my clients. 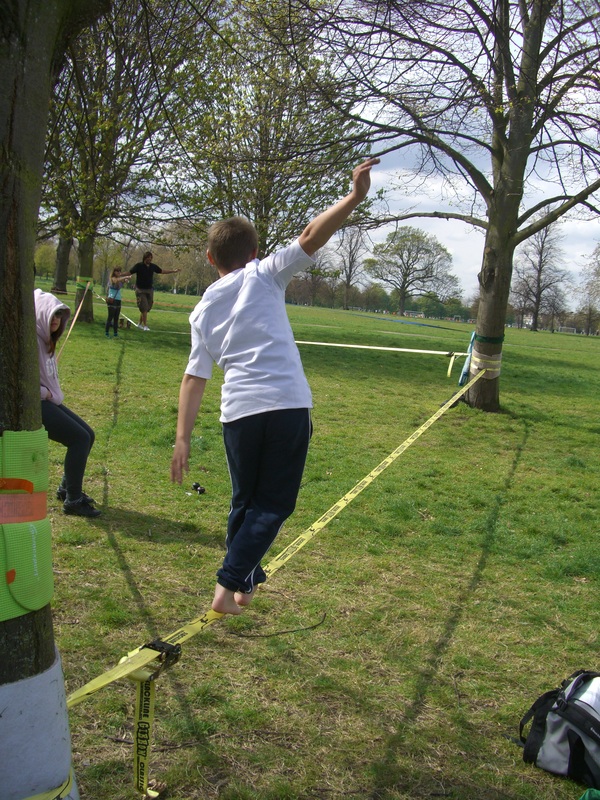 It was a most remarkable experience for me, and got me thinking that I would like to work with kids with so called ‘ADHD’, a) to get them slacklining and having some fun, and b) to further disprove that people with ‘ADHD’ can’t focus. 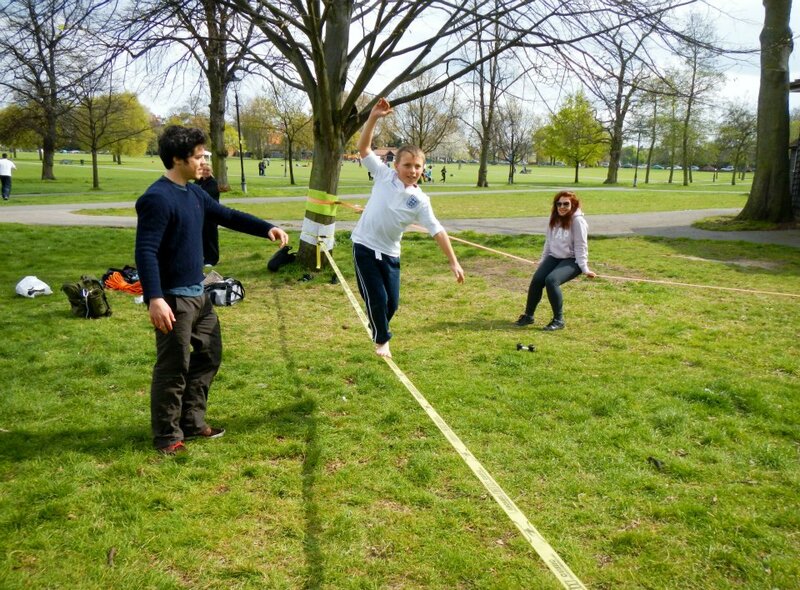 Harry Cloudfoot is a slacklining instructor based in London, working with all ages and skill levels. To book Harry to work with kids or your community, contact him here. This article was featured in Terry Matlen’s ADHD newspaper. Does ADHD have benefits in certain environments? 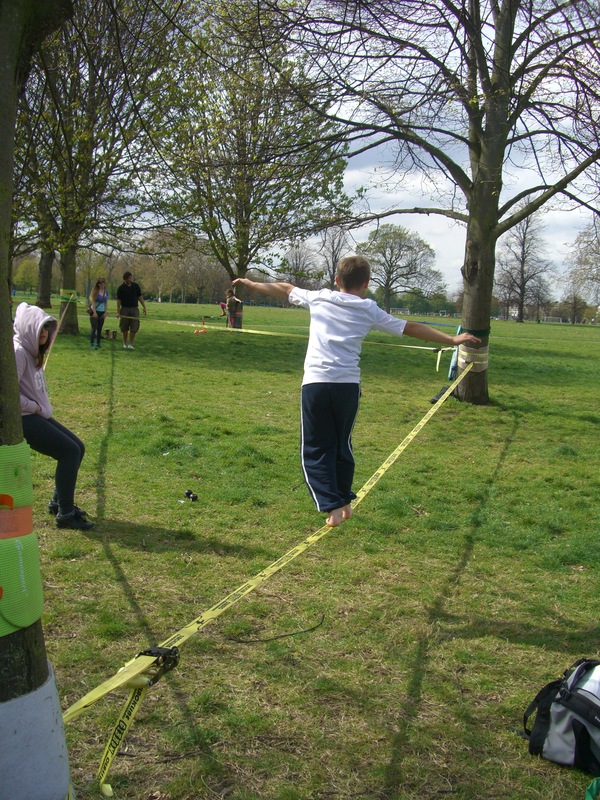 This entry was posted in Events, Slacklining and tagged ADHD In Teenagers, Clapham Common, cure ADHD, dyslexia, free clubs in london, harry cloudfoot, improve concentration, improve focus, kinaesthetic learner, learning difficulties, nullify ADHD, slackline, slackline classes london, slackline club london, slacklining, slacklining nullifies ADHD, stop ADHD by harrycloudfoot. Bookmark the permalink.